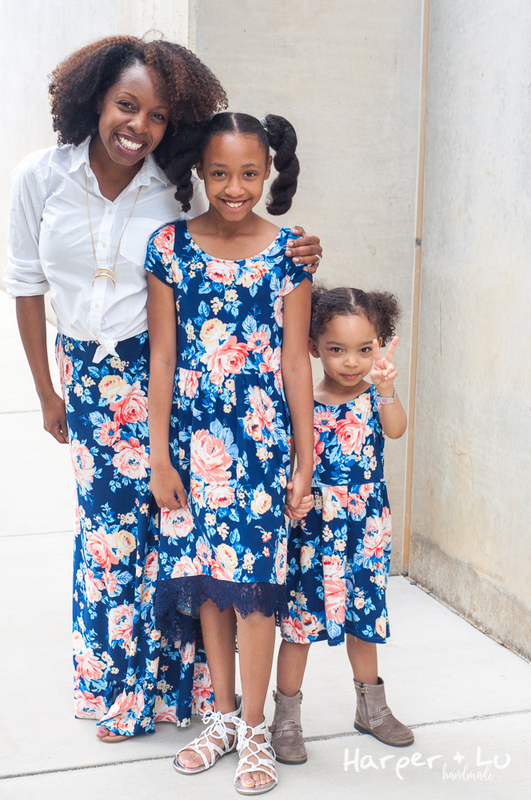 True story: I purchased the Love Notions Ladies’ Bluezette* pattern for myself over a year ago and never got around to sewing it up (story of my life – seriously). However, when Tami and Kelly announced the Bluezette Blog Tour – I KNEW it was finally time to give it a try! 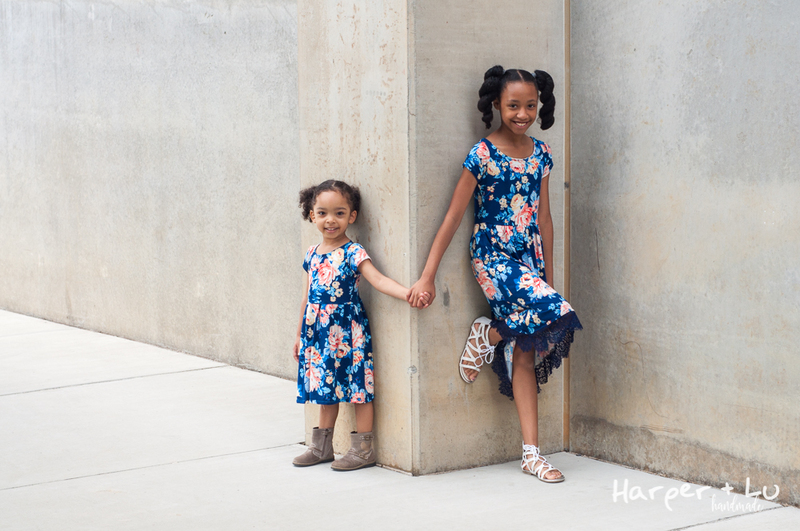 My daughter and little sister were both feeling neglected (suggesting I mostly sew for myself which is not completely true — just mostly true) and really wanted me to make them dresses. 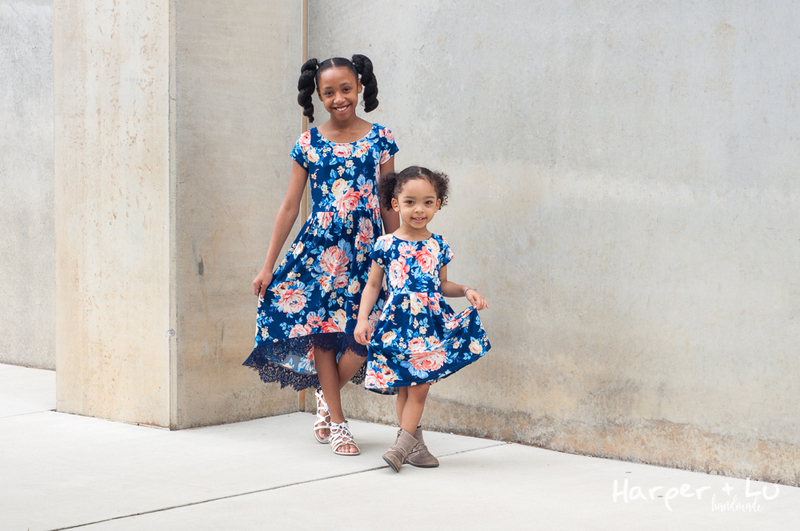 I figured this would be a chance to get a sewing win with the kiddos, while also practicing any techniques required in the pattern for when I make my final version. 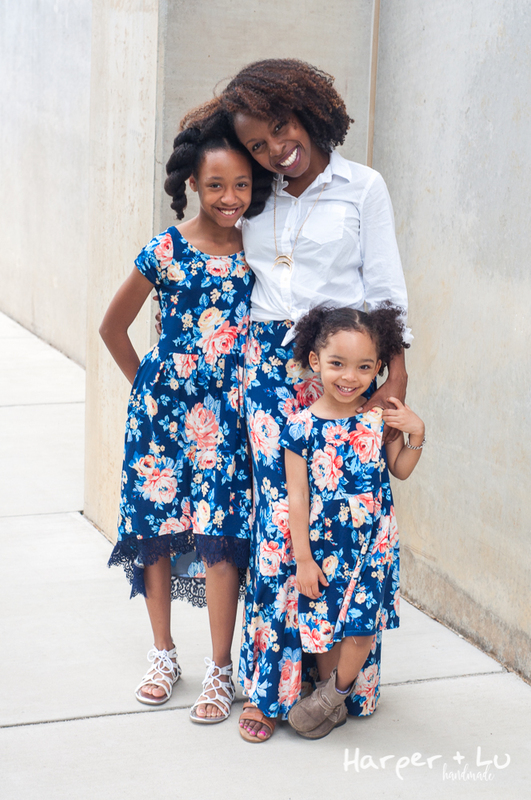 It just so happens that I had the perfect Corrine Floral from So Sew English Fabrics leftover from my Circle Skirt post – so it would seem that these dresses were always meant to be! *affiliate link – clinking any of the links in this post with an asterisk, and making a purchase, means I get a small contribution to my fabric and pattern fund — my fabric stash thanks you in advance! I had just about two yards left of the fabric after my circle skirt. I used the Girl’s Bluezette* pattern for both my slim almost 4 year old and my even slimmer almost 11 year old sister. For my little one – I SHOULD have cut a size 2 bodice with a size 4 width, but I was lazy and overly confident anxious to whip one up so I figured 1.5″ or so wouldn’t make a difference — BIG MISTAKE! The bodice ended up being HUGE – whoops! I ended up leaving the width in (I actually didn’t mind it), but the NECKLINE – ugh, it was NOT good! And I ended up pinning out a pretty substantial amount of the neckline which changed the shoulder angle a bit (it’s not noticeable anymore) and then serging it off. As always – I feel like you aren’t learning unless you are learning from your mistakes, so I learned a big one here. Follow the sizing chart even if you are feeling confident that your kid has definitely grown into a different size – it will save your sanity. For my sister’s version, like a good seamstress, I actually did blend two sizes (a size 10 bodice, with a size 12 length). This ended up working out perfectly – despite the fact that I couldn’t try the dress on midway. For her version, I had made the hem plenty long, but then when I decided they both needed sleeves because I was not interested in doing facings for the sleeveless versions I had planned, I mistakenly started to cut my daughter’s sleeeve out of my sister’s skirt hem — WHOOOPS!! No worries – accidents are the mother of all creativity (or something like that, right? )… I had about a yard of this lace fabric sitting around and decided that this would be an excellent time to try adding it to one of my projects! I pinned it down, basted it with my sewing machine and then serged and top stitched the hemline.What’s nice about this is that the lace helps to make it seem more pre-teen friendly, while serving the purpose of adding more length to the dress! What a way to turn lemons into lemonade? There are few things that warm my heart more these days than seeing the excitement of folks enjoying my makes! 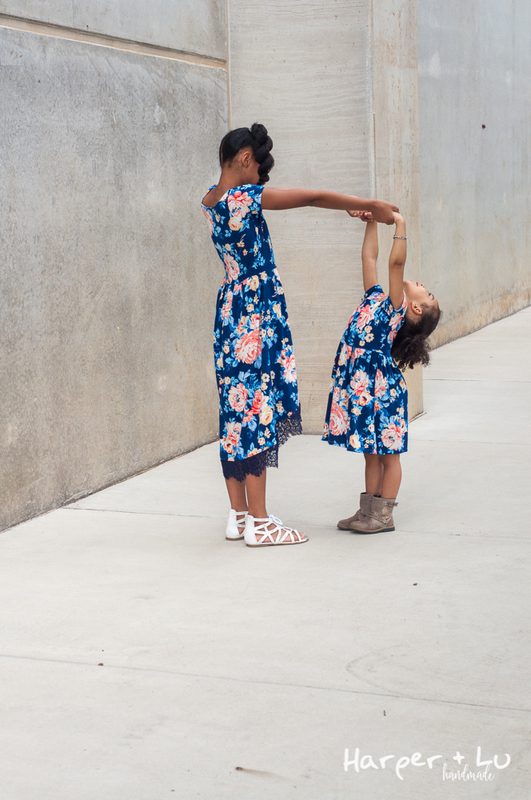 My sister and little one got such a kick out of having the same – yet different dress. We had a blast taking photos! Wow – that’s a lot of floral in one picture! I’m telling you – who knew 3 yards of fabric could stretch so far??? Thanks for stopping by my stop on the blog tour! Ok – so who loves prizes! If that’s you (I know its me!!) then click the link below and follow the steps to be entered into a raffle for some great prizes – including a $25 credit to the Love Notions site. 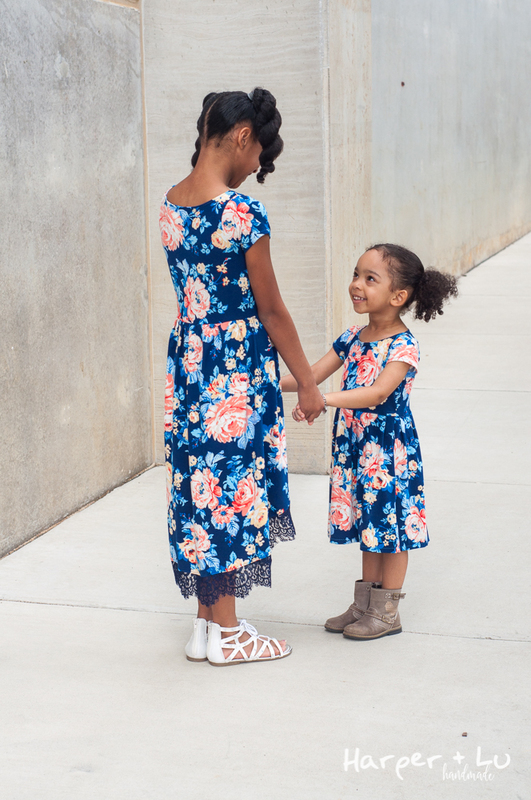 Also, if you are interested in making up one for yourself or your kids, there are sale prices on the ladies and girls Bluezette patterns. Ladies’ will be $8, girls’ $6. Don’t forget to check out the other stops on the tour! So much prettiness in these pics!!!! Just lovely, Mac! Here here!! More self sewing time is time well spent! Beautiful outfits and pictures!!!!! You really maximized your 3 yards of fabric!! !